Description - 2 Mil gloss, white polyester with permanent adhesive for thermal transfer printing. UL recognized (MH16411) and CSA accepted (99316). RoHS compliant. Use - This label is general purpose polyester with excellent smear, scratch and chemical resistance. Also used for top side labeling in PCB applications, property ID, warning instruction and service labels for durable goods. Use on painted metals, glass, high energy plastics and metals, acrylics, fiberglass, stainless steel and PCB’s. Description: - 2 Mil gloss, white polyester with a heavy coatweight of hi-holding permanent acrylic adhesive designed to permanently bond to the most demanding surfaces. This material has excellent chemical resistance and holding strength even at high temperatures. UL and CSA approved. slightly oily metals. Thick adhesive caliper provides for stronger bond on textured surfaces. Powder Coating, WIP, Property ID, Asset Management, Durable Goods, Rating Plate labels and more. Description: 2 Mil gloss top-coated, white polyester with excellent chemical, scratch and weather resistances. LMP6010 is a thermal transfer printable, with heavy double coating of industrial permanent pressure-sensitive acrylic adhesive. Use - Chemical resistant, WIP, Property ID, Asset Management, Durable Goods, Rating Plate labels, instruction / warning labels and oily surfaces. LSE Plastics, HSE Plastics, Metals, Polyethylene, Glass. Description - 2.0 Mil matte, white topcoated polyester, with an aggressive acrylic permanent adhesive. The unique topcoat, when paired with certain ribbons, has excellent abrasion and chemical resistance to Brake Fluid, Diesel fuel, IPA, acetone, Toluene, MEK and Petrol. This chemical resistant polyester is designed to permanently bond to the most demanding surfaces, including low and high surface energy plastics, painted metal and polycarbonate. UL Recognized. Use - Automotive, Electronics (e.g. chemical cleaning, degreasing) and chemical labeling. Description - 2 Mil homogeneously pigmented white polyester with a general industrial grade permanent acrylic adhesive designed to permanently bond to the most demanding surfaces. Has excellent durability and when used in conjunction with LMW2100, LMW8100 series ribbon. Use - Aviation, Automotive, Chemical Storage, Electronics and Pharmaceutical. Description - 2 Mil UL Matte Silver metallic PET features excellent tear strength, heat resistance and dimensional stability. It resists scratching, chemicals and moisture. Also shows no degradation in wide swing temperature variations. UL file MH17205. Material is RoHS compliant. Use - A high performance adhesive that will bond to a variety of substrates, including LSE plastics, engineering grade plastics, bare, coated or painted metals including powder coat and enamel paints. Suitable for Product ID, Asset Tracking labels, Rating Plates, Warning, Instruction and service labels etc. Description - 2 Mil Matte Silver polyester with a double coatweight of hi-holding permanent acrylic adhesive is designed to permanently bond to the most demanding surfaces. Thick adhesive caliper provides for stronger bond on textured surfaces. Has excellent chemical resistance and holding strength even at high temperatures. UL recognized and CSA accepted. Use - A high double coatweight of a high performance adhesive that can permanently bond to a wide variety of substrates including HSE and LSE plastics, textured and contoured surfaces, powder coatings and slightly oily metals. This label is suitable for Product ID, WIP, Asset Management, Durable Goods and rating Plate labels. LMP6101 substitutes for stamped metal and riveted plates. Description - 2 Mil Bright Chrome Film with a permanent solvent acrylic adhesive. The film features excellent tear, heat and dimensional stability. It also features High Opacity and Chemical Resistance. Designed for printing with solvent and water based inks, UV and thermal transfer with select printer ribbons. Use - Low surface energy plastics, bare coated or painted metals including powder coat and enamel paints. It offers medium tack for short term repositionability. Adhesive has low ooze and excellent chemical and UV resistance for outdoor industrial applications. Description - 2 Mil gloss, white, tamper evident “void” polyester with permanent, pressure sensitive adhesive. This material shows tampering when removal is attempted by leaving a “void” word pattern behind on the application surface. The compact format of the “void” message permits manufacture of small labels (.5” x 1.25”). This material offers excellent thermal stability, moisture resistance and chemical resistance. It has excellent quick tack and bonds well to a variety of surfaces, including LSE plastics. UL recognized and CSA accepted. Use - Any application requiring tamper evident performance. 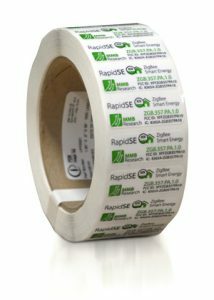 LMP6201 is perfect for non-transferable labels in automotive, appliance, and electronic industries. Tamper-indicating labels and seals are ideal for over-the-counter drugs and other packaging applications. Other applications include: property ID, warning instruction and service labels, security labels, authentication and tracking, parts ID and inventory control. Description - 2 Mil semi-gloss, white polyester with unique micro channels throughout the structured adhesive. This allows outgassing on plastic molded parts so label regains its neat appearance. Adhesive offers excellent chemical resistance and holding strength even at high temperatures. UL pending. Use - Durable Goods, Name Plates, Rating Plate labels, Warning, Instruction, and Instruction labels.